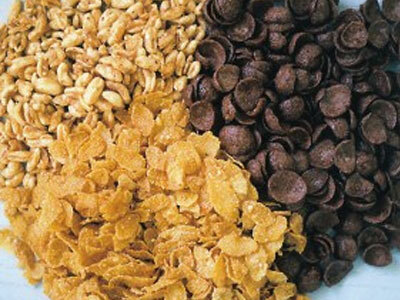 We are the specialist for the drying of coated and uncoated breakfast cereals! Grits, flakes, balls, bobs, co-extrudates ... - there are the most different kinds of breakfast cereals and their pro-products. Special geometries of extrudates with partially highly concave/convex forms often cause an undesirable agglomeration of the products in the dryer. The consequences are a jamming of the individual extrudates on the one hand and an uneven drying result on the other hand, because the moisture at the contact points can be drained off very poorly. The use of highly gluey spraying solutions requires good cleaning facilities. STELA meets these requirements and offers a tailor-made programme of belt dryers for breakfast cereals. No matter whether it concerns flakes or extrudates, 1-, 2-, 3- or multiple belt plants. The dryer is divided into several temperature and air zones so that it can be adjusted optimally to the respective product parameters. The fully-automatic control adjusts the optimum air temperature and volume and adapts it to the changing product and environmental conditions. The dryer consists of a frame construction taking over all supporting tasks. Thus it is possible to provide the four sides with largely dimensioned doors. Accessibility is an important criterion for a hygienic process! The system works with a very low bed depth. This is one of the basic conditions to achieve a high product quality.